Serious books on clothing and its functions appear from the 19th century as imperialists dealt with new environments such as India and the tropics. 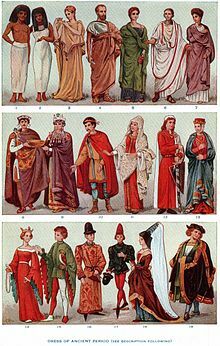 Some scientific research into the multiple functions of clothing in the first half of the 20th century, with publications such as J.C. Flügel's Psychology of Clothes in 1930, and Newburgh's seminal Physiology of Heat Regulation and The Science of Clothing in 1949. By 1968, the field of environmental physiology had advanced and expanded significantly, but the science of clothing in relation to environmental physiology had changed little. There has since been considerable research, and the knowledge base has grown significantly, but the main concepts remain unchanged, and indeed Newburgh's book is still cited by contemporary authors, including those attempting to develop thermoregulatory models of clothing development. Former 3rd Duke of Fife wearing a traditional Scottish kilt skirt (1984). For example, Jains and Muslim men wear unstitched cloth pieces when performing religious ceremonies. The unstitched cloth signifies unified and complete devotion to the task at hand, with no digression. [փա՞ստ] Sikhs wear a turban as it is a part of their religion. Jewish ritual also requires rending of one's upper garment as a sign of mourning. There are many concerns about the life cycle of synthetics, which come primarily from petrochemicals.Կաղապար:Weasel inline Unlike natural fibers, their source is not renewable and they are not biodegradable. ↑ Hertig, Bruce A (February 1969), «Book review: Physiology of Heat Regulation and the Science of Clothing», Journal of Occupational and Environmental Medicine 11 (2): 100, doi:10.1097/00043764-196902000-00012, PMC 1520373, http://journals.lww.com/joem/Citation/1969/02000/Physiology_of_Heat_Regulation_and_the_Science_of.12.aspx, վերցված է 8 September 2010 (reviewer's name appears next to Newburgh, but was not the co-author. See also reviewer's name at bottom of page). ↑ Hoffecker, J., Scott, J., Excavations In Eastern Europe Reveal Ancient Human Lifestyles, University of Colorado at Boulder News Archive, March 21, 2002, colorado.edu Archived 2011-07-19 at the Wayback Machine. ↑ Mary Louise Roberts, "Samson and Delilah revisited: the politics of women's fashion in 1920s France." American Historical Review 98.3 (1993): 657–684. ↑ Steven Zdatny, "The Boyish Look and the Liberated Woman: The Politics and Aesthetics of Women's Hairstyles." Fashion Theory 1.4 (1997): 367–397. ↑ Changes of Free Formaldehyde Quantity in Non-iron Shirts by Washing and Storage Archived 2011-07-22 at the Wayback Machine.. Journal of Health Science. ↑ The Textile Materials Eco Battle Between Natural and Synthetic Fabrics "Steven E. Davis, Sweatshirt Station". Tochihara, Yutaka; Ohnaka, Tadakatsu, eds։ (2005), Environmental Ergonomics: The Ergonomics of Human Comfort, Health and Performance in the Thermal Environment, Elsevier Ergonomics Book Series, Vol.3, Amsterdam & Boston: Elsevier, pp. 315–320, ISBN 0-08-044466-0, https://books.google.com/?id=qvh2sdJoQR8C&printsec=frontcover, վերցված է 8 September 2010 (see especially sections 5 – 'Clothing' – & 6 – 'Protective clothing').